AmaWaterways’ river cruise through the South of France isn’t billed as a food and wine-themed vacation. But it very well could be, since traveling through this beautiful region means sipping local wines and tasting regional cuisine in hallowed foodie locales such as Lyon. What’s more, the AmaDagio cruise on the Rhône River recently included opportunities to attend a cooking class in Avignon and learn how to make authentic French baguettes in a real bakery in Viviers. For us, the “Provence & Spain” river cruise began in Lyon, France, although most of our fellow passengers started with three pre-cruise nights in Paris and continued afterward with a trip to Barcelona. My sister and I chose to take just the seven-night cruise, flying into Lyon and disembarking in Arles to fly home from the Marseille airport. Flying from the U.S. meant an early morning arrival and waiting in the ship’s lounge for several hours until our room was ready. The kitchen staff did set up a spread at lunchtime, though, that included the most delicious pea soup ever, the first sign of the fabulous meals we would enjoy on board during the week. Here’s a summary of the France river cruise. PHOTO: The city of Lyon from the deck of the AmaDagio. 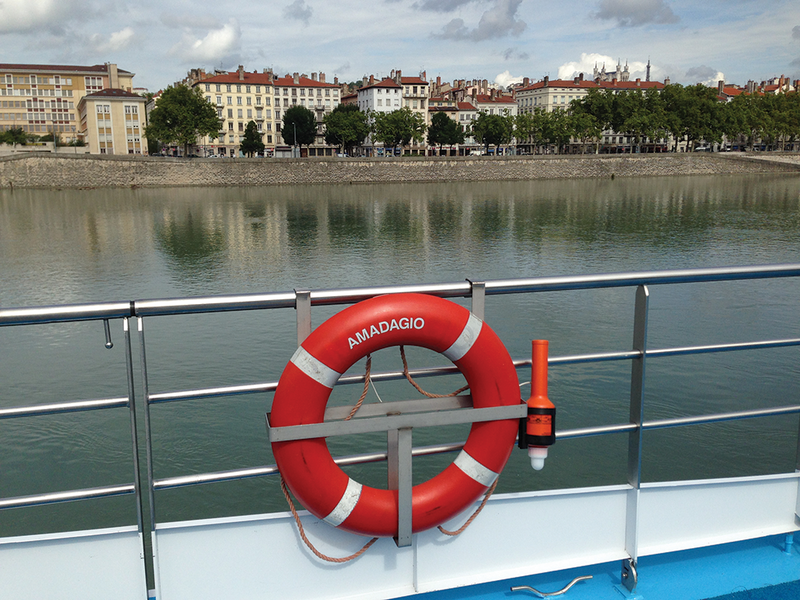 The 150-passenger, 2006-built AmaDagio will continue to operate the Rhône River cruises through the South of France in 2015. The ship itself is supremely comfortable, although it doesn’t have all the bells and whistles of newer vessels. But it does have French balconies in almost all cabins; those on the lowest of the three decks have two windows. Our Category B cabin measured 170 square feet and included the convertible twin/queen beds, an upholstered chair, a wardrobe/closet, and a desk with the flat-screen TV that also can be used to access the Internet or watch first-run movies (both complimentary as is Wi-Fi throughout the ship). Staterooms have plush down bedding, marble-appointed bathrooms with hairdryers, terry robes and slippers and complimentary bottled water replenished daily. Electricity is 220v with European two-pin power outlets, so it is recommended that you pack the adapter and/or converter. The AmaDagio has a main lounge used for early- and late-riser continental breakfast, light lunch, tea time, briefings on the next day’s events, and music, dancing and drinking. Entertainment is provided by the onboard musician and his digital piano or by local performers who board the ship in the evening, sometimes violinists or a pop band. The top deck has a walking track, a whirlpool and loungers as well as shaded areas and a comfortable observation area popular for watching the historic buildings and bridges pass by. When approaching low bridges, the bridge and some of the canvas shades were lowered and guests were asked to leave the area for their own safety. For those with accessibility issues, AmaDagio has an open elevator between the second and third decks. 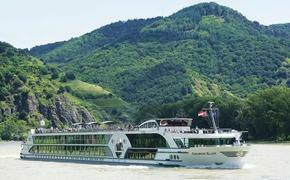 AmaWaterways offers tours for “gentle walkers” that move at a slower pace with limited walking. Each excursion lists a degree of difficulty, from one (easy walking over level ground for short distances) to five (difficult, with a long, strenuous walk/bike ride with many stairs, inclines or hills, and requiring excellent physical condition). The ship also has a small fitness center and massage/hair salon. The recommended attire is casual during the day, with comfortable shoes for touring, and “country club casual” for dinner. Some wear dressier attire for the Captain’s Dinner. The onboard atmosphere was warm and convivial, with well-traveled passengers who mingled, made dinner plans and met up for drinks. Adding to the fun were the waiters, bartenders and other staff members who knew our names within a day, often shared a quick joke or quip, and remembered what we like to drink. Hands down, the food on this ship was delicious. Described as continental cuisine, the offerings on the AmaDagio often included French selections suitable to the region through which we were sailing, often made with fresh ingredients purchased locally. Breakfast is buffet-style, but there’s a menu to order egg dishes and other hot selections. Lunch is a buffet as well, with salads, soups, pressed sandwiches, hot entrees and desserts. For example, one day the lunch buffet included Mediterranean salad with feta, marinated salads and a ciabatta sandwich with onion, olives, bacon, bell peppers and cheese. There were two kinds of the always-delicious soups — a tomato with Calvados (French apple brandy) cream, and poultry consommé with noodles and green beans. Main courses included spinach ravioli, lime-herb marinated mahi-mahi and a French selection called “Fricassée de Poulet Façon Grandmère Bocuse” — a sort of a chicken stew made in the style of the grandmother of Paul Bocuse, the internationally renowned nouvelle cuisine pioneer, who happens to be from Lyon. After that, there was a selection of sweets, including ice cream and toppings, a cake, fresh fruit and French cheeses. Dinner was usually at 7 p.m. in the main dining room, which seats all guests at once. Passengers decide where and with whom they wish to sit, or the maître d will happily find space. Dinner is a multi-course meal with a choice of entrees, including a vegetarian option. Appetizers might include a duet of shrimps, with both tempura and salad, and corn tortillas with red beans, mixed greens, baby corn and cilantro vinaigrette. In the soup course, guests choose beef consommé or lobster bisque. The main courses included a grilled fillet of sea bass, roasted beef tenderloin with ginger mashed potatoes, and eggplant and mozzarella timbale. Mid-cruise was the Provençal Dinner. Highlights included a Provençal cheese crème brûlée, cream of forest mushrooms soup, filet of Mediterranean sole, braised beef in red wine, and lemon tartlet with meringue. The AmaDagio has a second restaurant, Chef’s Table, which accommodates 24 people per night. There is no additional charge, but guests must make reservations. If there’s space, the staff will accommodate you a second time. Our Chef’s Table dinner included a goose liver mousse amuse-bouche, a lemon pepper-crusted salmon appetizer, cream of cauliflower soup with truffle foam and a choice of entrées—grilled pike perch with sautéed spinach and eggplant mash or grilled beef tenderloin with potatoes and vegetables. The ship serves complimentary local wines and beer with lunch and dinner. Tea and coffee, including some specialties such as espresso and café lattes, are available at no charge throughout the day and at meals. Soft drinks and cocktails are available at additional cost. Complimentary bottled water is replenished daily. PHOTO: Passengers learned how to cook French appetizers in Avignon. Shore excursions are included in the cruise fare. On most days, there is one tour, sometimes two and sometimes a choice. For example, our first full day in Lyon included a motorcoach tour of the city’s highlights; we then choose to stay in town for lunch at a bouchon, which serves traditional Lyonnaise food. There is flexibility, but we had to find a taxi to drive us back to the ship. On Day Six, we overnighted in Tournon, and the next morning, passengers had a choice of three tours — a red wine and chocolate pairing, an Hermitage wine tasting or a steam train ride through the nearby gorges. We departed at 1:45 p.m. to spend the evening in Viviers, where guests could choose a ghost walk tour in this ancient walled city or a visit to a bakery to learn how to bake baguettes and nougat. The bakery visit and steam train ride both are what AmaWaterways calls “limited-edition tours,” which are complimentary but must be reserved in advance since there’s only so much space. 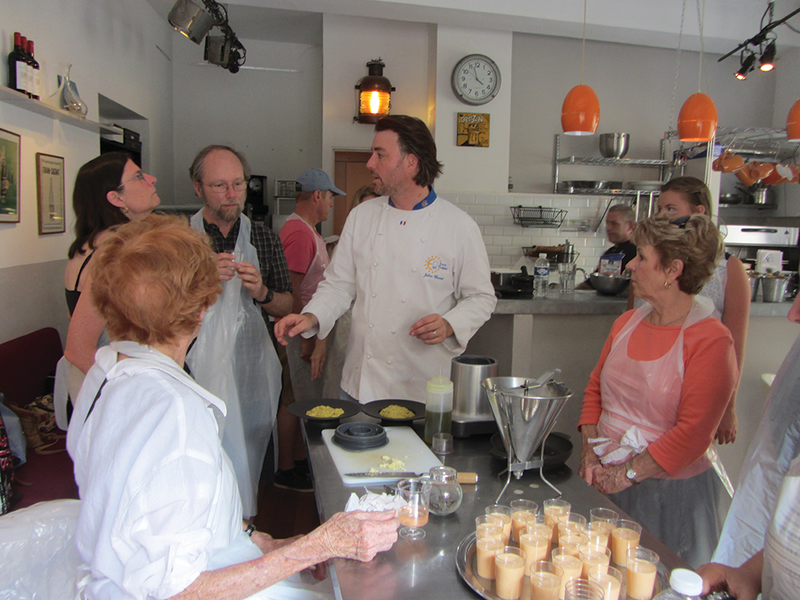 Another limited-edition tour was the cooking class in Avignon. The Viviers bakery was just a short stroll from the ship that evening. 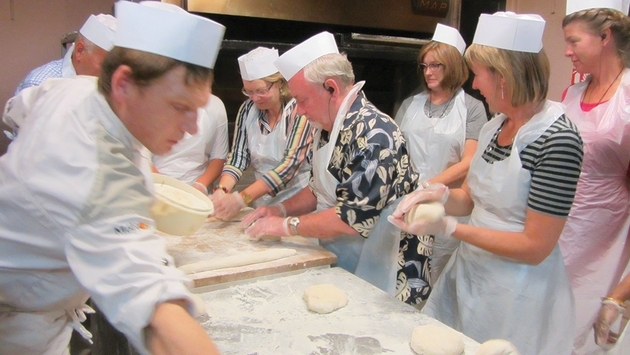 While we didn’t make the bread dough, we watched the baker make it. He then let us roll the dough into the proper form and score it, done for appearance but also so the baguette doesn’t burst in the wrong spot. The baker loaded the baguettes into the large oven and, minutes later, we walked back to the ship with a still-warm loaf of French bread. In Avignon, we walked through the winding streets to a cooking studio, escorted by our chef instructor. With tables stretching out the door to accommodate our group, the chef had us dicing, slicing and chopping as he showed us how to make codfish brandade, olive tapenade and other appetizers. We feasted on our fare and washed it down with a little Provençal rosé. For more information, visit www.amawaterways.com; 800-626-0126. A version of this article appears in print in the November 2014 issue of Agent@Home Magazine.